Includes 18 of the all-time best performances of Riverdance from its extraordinary beginnings at the Point Theatre, Dublin, with original stars Michael Flatley and Jean Butler, through its phenomenal success in Radio City Music Hall, New York to its latest live recording in Geneva. Riverdance boasts an international cast featuring the remarkable Riverdance Irish Dance Troupe, the cream of Irish musicians in the Riverdance Band and a spectacular array of talent from Spain, Russia and America, performing to the magic of Bill Whelan's music. 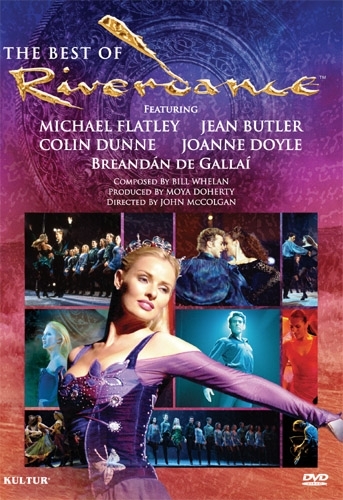 More electrifying than ever, this DVD is a treasure for Riverdance fans worldwide! 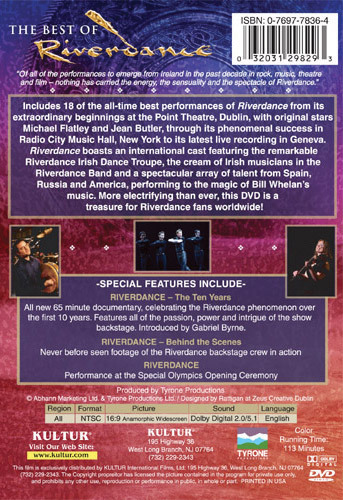 RIVERDANCE - The Ten Years: An all New 65 Minute Documentary, celebrating the Riverdance phenomenon over the first 10 years. Featuring all the passion, power and intrigue of the show backstage. Introduced by Gabriel Byrne. RIVERDANCE - Behind the Scenes: Never seen before footage of the Riverdance backstage crew in action. RIVERDANCE: Performance at the Special Olympics Opening Ceremony. "Every aspect of the show that has made Riverdance such an unqualified success is here for your viewing pleasure. So, with the court's blessing, throw this disc in the player, crank up the volume, and sit back and enjoy this crowd-pleasing retrospective." "Kultur has done a nice job of delivering a wide-ranging retrospective of the show and providing a couple of fan-friendly extras. For those well-acquainted with the show, it's a nice keepsake, while the curious will definitely be able to sate their thirst for the show with this disc."